Saturday, June 17th is the big day for our beloved annual Secret Gardens of Lake Forest Park Garden Tour & Market! For one day only, you get to peek behind the gates and tour six of the most special private gardens in north Seattle. Exquisite landscaping, glorious flowers and plants, peaceful water features, unique garden art, and more will inspire and delight you on this wonderful tour. Each garden will also feature live music, working artists, and gardening experts to enrich your experience and make every stop extra special. Meanwhile, back at Town Center, the garden market will offer up a dazzling array of native plants and flowers and handcrafted garden art to help turn your own home retreat into something wonderful as well! The ever-popular gardening celeb Ciscoe Morris from KIRO-FM will be on-hand at the garden market from 11 to 1 to talk gardens with emcee Mike Munro and answer your gardening questions. And after that, Seattle’s most relaxed ukulele band Strum will take center stage to entertain and amuse throughout the afternoon. The annual Secret Gardens event is co-presented by four local community nonprofits – the Shoreline-Lake Forest Park Arts Council, the Lake Forest Park Stewardship Foundation, the Lake Forest Park Garden Club, and of course, Third Place Commons. All proceeds benefit these four organizations and are also used to purchase public art for Lake Forest Park. The market opens at 9 AM in the lower lobby of Lake Forest Park Town Center when you can also pick-up your garden maps and get an early jump on the shopping before the gardens open their gates at 10 AM. The gardens and market close at 4 PM, so be sure to arrive early so you don’t miss a thing! Tickets are $20 on the day, but just $15 each when you buy early either online or at one of the ticket outlets, including the Lake Forest Park Farmers Market this Sunday from 10-3. 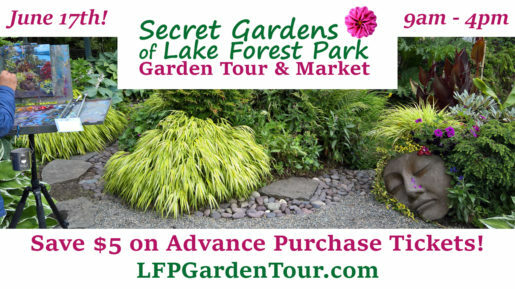 Get your tickets online or find an outlet at lfpgardentour.com/tickets. And speaking of the farmers market and art, did you know that our annual Crafts Day at the Farmers Market is coming up on Sunday, July 17th? 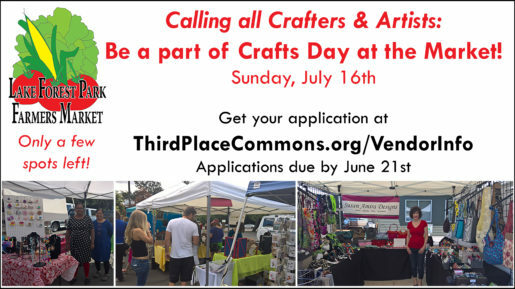 We still have a few spots left for Washington artists and crafters interested in sharing their creations at a market that regularly hosts 7,000 to 9,000 shoppers per week. Crafts Day applications are available online here and all complete applications received by Wednesday, June 21st will be considered. So spread the word and get your own materials in right away! Previous Post: New Music Series, Farmers Market, & More in June - The Fun Starts June 2nd!